In fact, by the end of almost every assignment, I plead with my fiancé and other loved ones, using almost the same lament each time. I tell them I hate copyediting, and please—no matter what I say—don’t let me do it again. Then, a few months later, an editor contacts me, and I gladly take on the assignment before even asking the above-mentioned loved ones. The truth is these assignments often offer a much-needed break from the stress of writing. For one weekend, I don’t need to pay attention to sentence flow, character development, or dialogue. I only need to focus on commas, hyphens, widows, and abbreviations. At the same time, assignments such as these strengthen my writing, allowing me to refresh my skills. I come away feeling like a good writer, one who knows where to place a comma (most of the time) and can determine when a number should be spelled out or written in numeral form. When I was in high school, I worked on the school newspaper for three years. When our teacher, who treated us like a professional staff, first asked why I wanted to write for a newspaper, I told him I was interested in creative writing, and I thought journalism would improve my editing skills. He told me this was not a fiction writing class, but I insisted writing articles would help me achieve my overall goals, and I was right. After three years, I could take any 800-word article and cut it down to 500. I could delete entire paragraphs, rearrange sentences, and rewrite leads. I learned how to be ruthless, and to this day, I am still able to cut our entire pages or sections of my work, admitting when the writing does not add to the greater good of the piece. In some ways, I feel similarly about copyediting and proofreading. While the entire process can be tedious, I come away feeling refreshed. I am also able to focus on the technical side of my brain, which allows for a sort of mental vacation. I must admit that I have always been technically inclined. I loved math in school, and I have always felt fond of computers. To me, these skills came naturally. Unlike my literary peers, I often did better on math tests than English essays or exams. But, I chose writing because it was a challenge and was ultimately meaningful to me. A sentence can be written in so many ways, and while there are many routes to solving a math equation, writing often surprises, turning down another, unexpected path before reaching its conclusion. While I have chosen writing (and only sometimes lament my decision), I think writers do benefit from using the more technical side of their brains. Copyediting is not a strict science, and I often find myself looking at a comma and wondering if it truly belongs in a sentence. I might call up friends, look at books, discuss with my poor fiancé, and then I realize I have spent thirty minutes contemplating a comma (which is why I am not an efficient copy editor). I worry that I will somehow make a mistake and place an unwanted comma where it does not belong, but then—after hours and hours of staring at the page—I realize that I truly love to write, and very few others would take more than a second to contemplate one comma in a sentence. Copyediting, too, reminds me that I have come a long way since I began writing. In fifth grade, I learned “a lot” was two words, and I never forgot this. The grammar rules and editing skills I have learned since then are astonishing, and as I finish the last page of my copyediting assignment, I feel a sense of achievement. If I hadn’t taken a step back to copyedit, I might not have reached this editing Zen. I realize, then, I have spent hours considering the minutia, and this has led me to once again see the big picture. 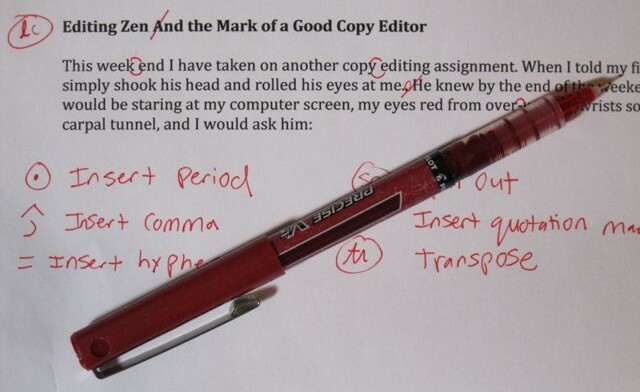 Sadly, I no longer use these traditional proofreading marks but instead edit electronically.